It has been awhile since I have been able to participate in the Papertrey Ink Blog Hop. Even though this wasn't a really old set (didn't have dust yet! ), it was one that had not seen any ink. And, that is the theme for this Blog Hop. I really loved this dress form stamp and die, and was happy to put them to good use finally. I think the design of them is very classic. I found this beautiful rose paper at a local craft store over the last weekend. It's my new favorite! It is from K and Company. There is a good chance that it might show up in more projects in the near future. ;-) I also like the way clear stamps, especially solid ones, stamp with Stampin' Up's Craft Inks. So, I hope you enjoy this project, and are inspired to use something older from your stash, maybe even alongside a new favorite. In my last post, I included some Valentine's cards that used gray as the sky background. Originally, I had cut these gray cards to use for the other project, so I decided to use them for a slightly different design using the same supplies. So, today you get two posts in on day! Hooray for gray being the new black! And, hooray for free rub-ons from Stampin' Up for their demos. Wow...it's been just over a month since I have posted to my blog. Good grief! Where did the time go. It seems that the holidays and then busy weeks of work make the time fly by. So, I decided that it was high time that I make a new post. I spent a crafty weekend with my friend Tiffany at her house last weekend, and brought along lots of pink, red, and other Valentine themed goodies to make some cards with. Stampin' Up sent this sheet of adorable rub-ons to all demonstrators who placed an order during December or January. So, what I great item to start with for inspiration! I really like their new rub-ons...the color is really vibrant, and it covers other colors well. See what you think! 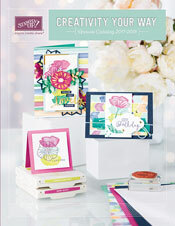 These are the Love Impressions Rub-Ons from the current Occasions Mini catalog. And, over at the Moxie Fab Blog, they are having the Gray is the New Black Challenge. So, I decided using gray as a sky color would be a unique way to play along. I hope you enjoy these!